Potential home buyers who want to get a manufactured home often wonder how easy it will be to get financing for these properties. While home loans for manufactured houses are not as plentiful as regular homes, there are still some options available, including from government backed home loan programs such as FHA. Most people are not aware that mortgage rates for manufactured home loans are very competitive. If you want to get approved for a manufactured home loan, below is information that you need to know. Find the best mortgage lenders that offer manufactured home loans with great rates and terms. The first thing to keep in mind is there is a specific definition under federal law for manufactured homes. This is important because it will affect the type of financing you can get. A manufactured home under federal law is a factory build home that was built after June 15, 1976. All of these homes are subject to the National Manufactured Housing Construction and Safety Standards Act of 1974. These homes must meet safety standards that were set by the Department of Housing and Urban Development. These rules are usually referred to as the HUD Code and were last updated in 2019. Retailers: The companies that sell manufactured homes often have financing available to make it easy for their customers to buy homes. In some situations, the builder will have relationships with financing companies and these can be used to finance the home. But it is a good idea to shop around and compare quotes you get from financing companies not affiliated with your lender. Specialized lenders: There are specialized mortgage lenders that do loans for manufactured homes and mobile homes. 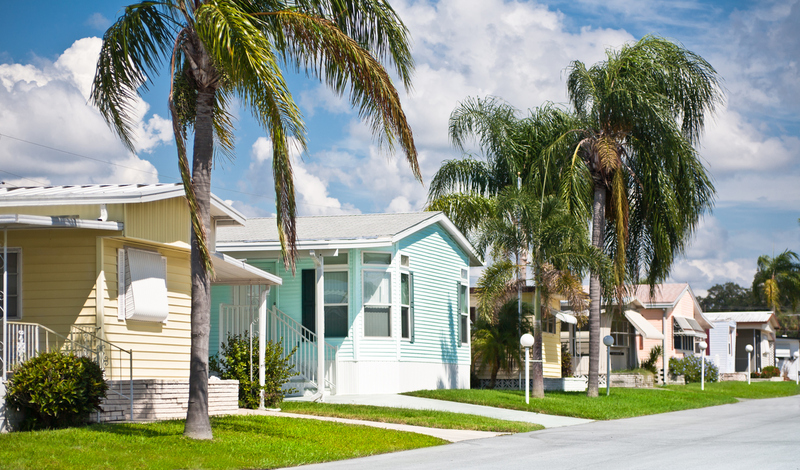 Any home lender may take an application for manufactured house loan, but these specialized lenders are more familiar with the specifics of manufactured home purchases. They may be easier to work with for some applicants. You usually should work with a specialized lender if you are buying a manufactured home where you do not own the property; you are not attaching the home permanently to the land; or you are buying a manufactured home that is not new or has had updates done. Ask about home loans with good mortgage rates. Standard lender: If you are buying a manufactured home and the property it is sitting on, and the home is permanently fixed there, you will have more loan options available. There are many banks, credit unions and mortgage brokers that can handle manufactured loans and mortgages for modular homes as well.. These loans are common for manufactured homes and mobile homes where the home is being situated in a park or manufactured home community. A chattel loan is for the home only and not the land. These loans are actually personal property loans. But chattel loans are also available where you own the land and are borrowing for the home on a separate basis. When you shop lenders for manufactured homes, be clear if you are getting quotes for home loans or chattel loans. A chattel loan will have a higher interest rate, often 1.5% higher or more. But chattel loans often have lower amounts borrowed and fewer fees, so they can be a good fit for some people. Benefits of a chattel loan are that you do not need to own the land, which keeps the cost down. Second, the closing process is faster than a home loan and processing costs are lower. On the down side, interest rates are higher and repayment periods are shorter, in the 15 to 20-year range. A lot of people with manufactured homes get chattel loans; 80% of new manufactured homes in 2015 were titled as personal property. There are several government-backed home loan programs that can be used to finance manufactured homes. The most popular is the FHA program. These loans are popular because they are easy to qualify for and have low interest rates and down payments. The home has to have been built after June 15, 1976. The home must fully comply with the HUD code and meet any other local requirements. Each section of the house must have the red Certification Label attached. You can get a FHA Title II loan that allows you to make a down payment of 3.5%. You can have average credit for this program and still be approved. These are real estate loans, so you will have to buy the home and property together. The other option is an FHA Title I loan. This is used sometimes for personal property loans where you do not own the land. But the home must be your primary residence; the installation site must have sewer and water service; and new manufactured homes must have a one-year warranty.